Where can I eat Paella in Madrid? Its a typical question from most tourists looking to dine out in Madrid even if the famous Paella is a dish from the Southern spanish city of Valencia! To cook a Paella takes time and from ordering to receiving your meal it can take over an hour. It is however possible to order in advance by telephoning the restaurant if you have sufficient Spanish to tell them what you would like. Alternatively you can use the time to try one of the many fine Spanish wines or simply pass the time soaking up the atmosphere! 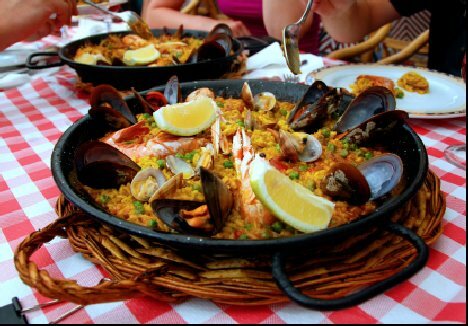 On this page we recomend the top three Paella restaurants in Madrid and also provide a brief guide to "What is Paella?" As stated at the beginning of the page this dish originates from the Spanish city of Valencia and the surrounding "Communitat Valenciana", community of Valencia, where the many rice fields produce the special rounded rice used in the dish. that doesn't mean that one cant enjoy a great Paella in Madrid! No one is quite sure on how this distinct type of rice came to Spain however many believe it was bought to Spain by the Arabs during the Moorish occupation. 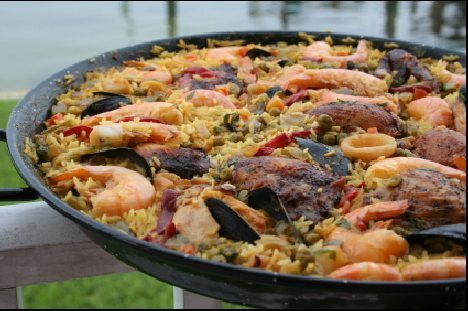 It is commonly accepted that a chicken or / meat paella was the original style before it became popular with tourists and took on its more famous seafood base. The truth of the matter is that nowadays you can order a Paella in Madrid with just about any vegetable, meat, poultry or seafood that you wish. Only 10% of the "triumphfullness" of the final dish is in the preparation with the majority of the effort needed in the cooking. What is important though is that the vegetables are cut into the smallest possible pieces, this allows their flavour to be transmitted to the rest of the dish. The typical Paella vegetables of runner beans, tomatoe, peppers and onion diced are all cut into small pieces ready to be added to the Pallera. "What is a Paellera?" I hear you ask. The Pallera is the flat bottom thin rimmed steel dish used in the cooking although this is a misconception that is now in everyday use as "Paellera" actually means the woman cooking the dish! This is the cruch of the matter! 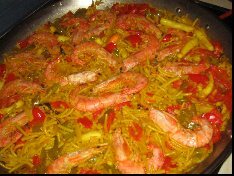 The traditional method for cooking Paella is to lightly oil the Pallera and gently fry the vegetables, once they´ve gone limp remove them and gently brown the meat. Add the vegetables again and stir once or twice. Cooking this way the oils and nutrients from the ingredientes are left in a thin film accross the bottom of the pan. Now comes the rice, the special Paella rice is added dry to the vegetables, meat and oil for a couple of minutes whilst being stirred continuously. This action gives the rice its flavour. Add water, colouring and bring to the boil, once boiling drop the heat to the lowest possible and leave to simmer for as long as it takes the rice to almost cook. Around 5 minutes before its done remove the heat and place a tea towel over the Paellera. Serve with a fresh lemon squeezed over the top. All Paellas are prepared in the same way with slight differences in ingredients. The famous tourist Seafood version normally contains cockles, shrimps and squid instead of the meat or poultry. So, where to eat Paella in Madrid? A very good example of the best of Valancian cooking in Madrid. The restaurant has stayed true to its roots both in terms of the wide selection of dishes from Valencia as well as the pricing! Whilst the paella is the principal motive for visiting the wide range of other traditional Spanish dishes means there are some tasty appertizers to fill that hour whilst you wait for the main course to cook. Worthy of note: The "Arroz Abanda" or black rice which is a squid and rice based dish similar to the Paella. Just ten doors up the road from the restaurant La Barraca the restaurant "La paella de la reina" (The Queens paella) offers a wide range of seafood and rice dishes from all over Spain but with a heavy focus on the rich mediteranean cooking of the Valencia region. A small and intimate restaurant that is very popular with the native madrileños due to the authenticity of the kitchen. All meals are prepared using only the freshest ingredients and for a true taste of Spain away from oppulent settings this is the right place to go. Worthy of note: The excellent "paella Bogavante" (giant crayfish) which has a truly unique taste!